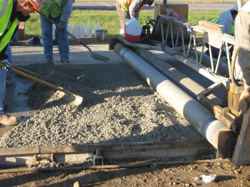 This report presents the results of the largest and most comprehensive study to date on portland cement pervious concrete (PCPC). It is designed to be widely accessible and easily applied by designers, producers, contractors, and owners. The project was designed to begin with pervious concrete best practices and then to address the unanswered questions in a systematic fashion to allow a successful overlay project. Consequently, the first portion of the integrated project involved a combination of fundamental material property investigations, test method development, and addressing constructability issues before actual construction could take place. The second portion of the project involved actual construction and long-term testing before reporting successes, failures, and lessons learned. The results of the studies conducted show that a pervious concrete overlay can be designed, constructed, operated, and maintained. A pervious concrete overlay has several inherent advantages, including reduced splash and spray and reduced hydroplaning potential, as well as being a very quiet pavement. The good performance of this overlay in a particularly harsh freeze-thaw climate, Minnesota, shows pervious concrete is durable and can be successfully used in freeze-thaw climates with truck traffic and heavy snow plowing.